I've not been satisfied with the way my last few batch of macarons have turned out. They have all been nobbly. So I thought I'd finally take the advice dished out in other blogs and use my Kenwood to mill the almonds and icing sugar together to make almond flour, rather than just sieving the almonds and sugar together and hoping for the best. I wasn't feeling too optimistic about the difference this would make, but the finish on these was phenomenal in comparison to the ones I normally turn out: check out the smooth shells on these little monsters! I also tried a different macaron recipe. 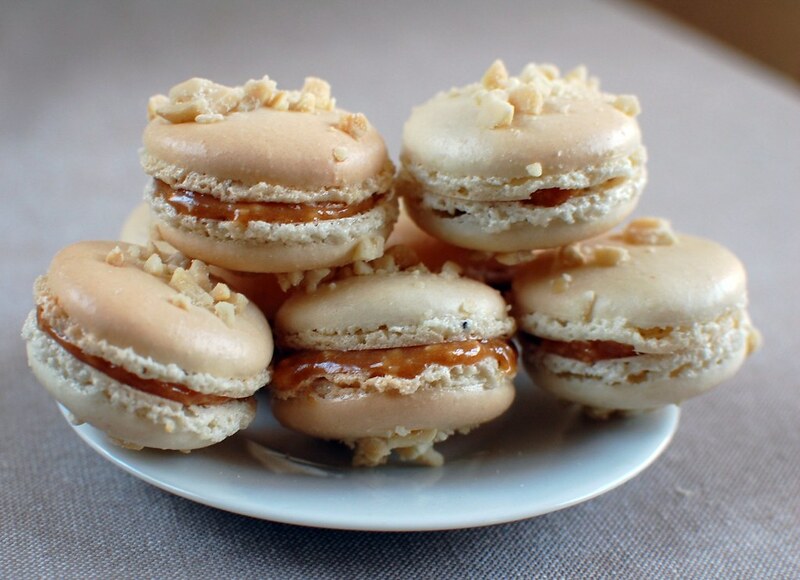 I normally use Tartelette's recipe, but I've had my eye on Ottolenghi's peanut and caramel macarons for a while and have seen others have great success with their macaron recipe. The recipe worked reasonably well, although I think I overbeat the meringue, as I had more air pockets than normal. It felt as though I had to put a bit more effort into the macronnage than normal, although I do know Tartelette's recipe of by heart now, so perhaps not being familiar with the recipe was the only reason for this. Most importantly, these are absolutely delicious! I fell in love with dulce de leche after spending a summer in Costa Rica, but I save it for a very occasional treat (watch out for a post next month showing how I used up the left over dule de leche in a cupcake). But, two days after making them, I felt like I'd missed a major trick with this recipe by not adding cocoa to the shells. Snickers Macarons, anyone? Grind the almonds and icing sugar together in a food processor until an almond flour is formed. Sieve the resulting mix into a large bowl. Beat the egg whites and caster sugar until soft peaks form, i.e. peaks which flop over a bit at the end. Don't overbeat, you do not want a stiff or dry meringue. Fold the almond flour into the meringue in three additions. This should take about 50-60 strokes. Test if the batter is ready to pipe by plopping a teaspoon of it onto a plate. If the peak on the mix sinks into itself within ten seconds, you are good to go. If not, give the mix five more folds, test again, repeat if required. Put the mix into a pastry bag fitted with a #1 tip, or a disposable pastry bag with the end snipped off to give a 1cm diameter hole. Pipe rounds of the mixture onto your prepared baking sheets, make these about the size of a £2 coin. Leave a gap of the same width between each macaron to allow for some room for spreading. Sprinkle on the chopped roast peanuts to decorate. Give the baking trays a couple of hard raps on a table to remove excess air (put a tea towel down first if you're worried about damaging the table!). Leave the shells to sit in a cool place for at least 30 minutes, until a skin forms on the shell (test this by taking a gentle poke on the side of one of the shells. Preheat the oven to 160*C.
Bake the shells for around 11 minutes, until you can lift them cleanly off their baking sheet. Leave to cool completely. Mix the dulce de leche and the peanuts together. Add salt to taste. Mesh the filling and the shells together. Ideally, you will leave the finished macarons to mature for at least 24 hours before eating them. *A word on dulce de leche. Don't bother making your own and don't be snooty and go to the deli for this. It's boiled, condensed milk. Buy this and be done with it. You can find it with condensed milk, usually in the same aisle as jelly and Angel Delight. These are absolutely gorgeous. Dulce de Leche rocks. I have a small kitchen too and I love my mini chopper! These look absolutely fantastic! You are quite right to be proud of them. 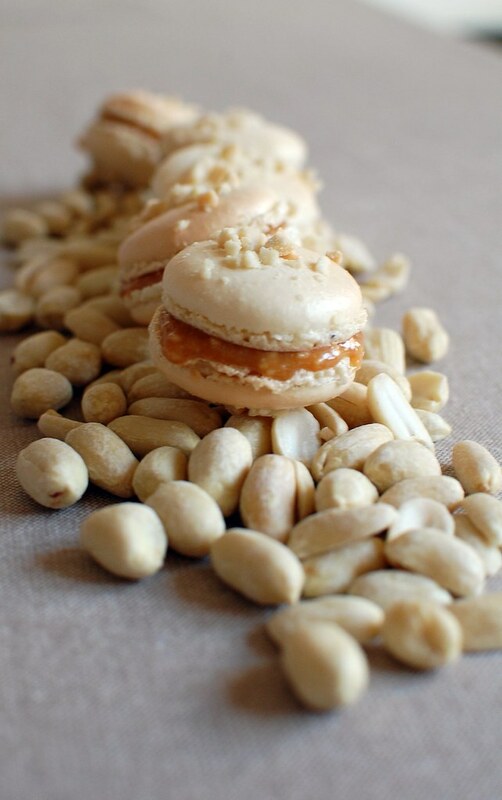 Salted caramel and peanut together sound brilliant. They sound like the best thing ever, I will have to make some! Thanks, ladies. I will never *not* give the almonds an extra grinding, now I know the difference this makes to the final finish. Wow, what beautiful macarons with great flavours! Those little mini choppers are brilliant, I use mine all the time.